Corcreggan Mill has been described as a peaceful sanctuary in the spiritual heart of Ireland's most beautiful, unspoilt county. Since the establishment of this popular tourist accommodation and workshop venue in 1990, the emphasis has been on the tasteful and authentic renovation of the old, stone buildings on the 5-acre site, to provide a comfortable, authentic and valuable holiday experience for all our guests. Led by guest recommendations over the past 25 years, Corcreggan Mill has virtually become a small village, offering a wide range of tourist accommodations in the same tranquil setting ... just 2 miles (3km) from Dunfanaghy, beside New Lake Nature Reserve, overlooking the sea. We’re delighted to receive the tourist board’s new, Welcome Standard, badge of approval ... where it’s the guest’s overall positive experience that’s paramount. Many guests agree that “A one night, flying visit will never give you such an experience.” So we’re happy to create an incentive by giving you price discounts (or a bottle of wine) to encourage you to extend your stay and get that valuable experience. On our site we provide several hospitality options, including our "quirky" B&B but also, the ever popular Carriage to which fantasia we've recently added Glamping Tents ... the absolutely unique Trawler and a new aspect to our little Campsite. 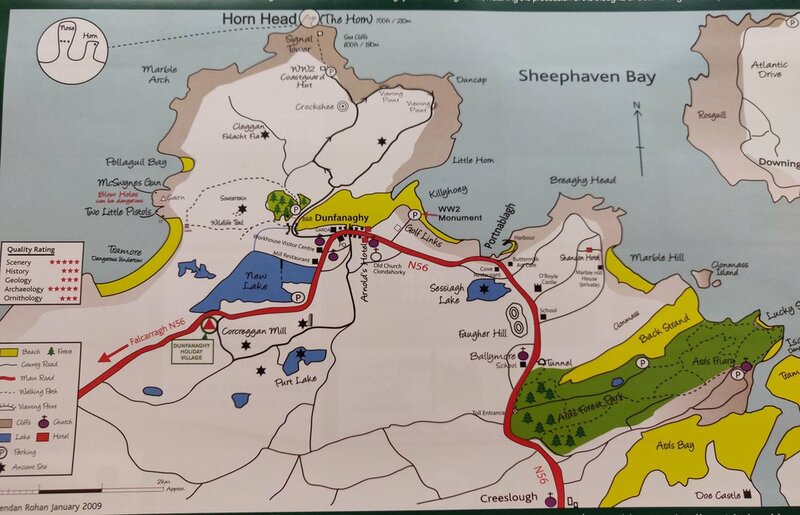 We delight in introducing our guests to the beauty, history and mythology of the area and Brendan Rohan, the founder of Corcreggan Mill, has made a free, coloured map (below) which covers a radius of 8km around Dunfanaghy, showing the key features which might be enjoyed during a visit of several days.